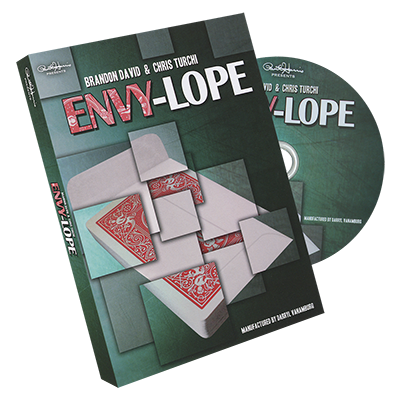 Today, when you order "ENVY-LOPE (BLUE) by Brandon David & Chris Turchi", you'll instantly be emailed a Penguin Magic gift certificate. You can spend it on anything you like at Penguin, just like cash. Just complete your order as normal, and within seconds you'll get an email with your gift certificate. The trick is phenomenal. I picked this up when it first came out and I was just waiting for a version in blue. I opened up the case and there, instead of in an envelope it was in a baggy, was the gimmick made with some weird card stock paper. It gets dirtier easier (picked up my fingerprints right away as I creased the envelope, which was tough to do and it looks awful creased) and just doesn't feel as good in my fingers. This isn't the same material as the other gimmick, so beware the care and feeding instructions on the dvd, that section was made for another type of gimmick. All I wanted was the same gimmick from the original DVD with a blue back. Apparently Paul Harris doesn't care about people who use blue decks. The idea is great except that there are few flaws with the gimmick,first the gimmick bends and creates wrinkles, second no ideal for small hands. 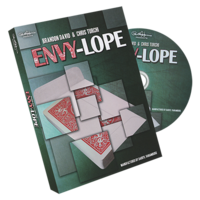 I waited a long time to purchase "Envy-Lope" because for a long time it was available with only a red-back. Most of my card work is with blue-backed decks and I didn't want an obvious deck switch. One of the Penguins helpfully suggested doing a deck color change, and then going into a red Envy-Lope. And I probably would have taken his advice, had this not later become availble with a blue back. Contrary to what some other reviewers have posted, the quality of mine was excellent. Yes, there is a crease, which is understandable to the viewer because you fold the empty card envelope when it first goes in to your pocket. I showed it to my wife and two sons, who have all seen a ton of my magic, and all three were blown away by the deck transposing into an envelope. They are a tough sell, because they have seen so much magic and because I'm usually unpolished when I run my test run by them. Tonight will be my first public performance and I am excited. My only regret is that because of its small size, you can't really do this on a stage. I'm not sure if this would work with a jumbo deck. 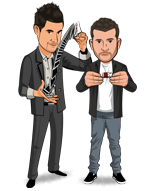 But if Brandon David and Chris Turchi came up with a stage version, I would definitley buy it. They would need to add an extra jumbo deck to the package, however, as the card really needs to be signed for maximum effect. Good work gentlemen! This trick is very visual. Spectators can't believe their eyes when they witness what happens. People reach for the deck and signed card and can't find anything. Only 1 downside, the blue gimmick is not the same quality as the red one. I would buy it if I were you. I am doing something I've never done before--posting a follow-up to a previous review. I was so excited about the reactions I received from my magic-saavy family, that I wrote the original review before performing this in public. My first public performance of this was last night. I used it as an opener to a show at my church. It ABSOLUTELY KILLED! Even though it wasn't my finale', it was the effect no fewer than a dozen folks specifically mentioned to me in church this morning. I was a little concerned that it was too small for the size of the crowd, about 75. But even the folks in the back pews were able to see and appreciate the transformation from deck to envelope. I almost didn't buy this, as I was concerned by other reviews criticizing the quality of the blue version, compared to the red, which is currently out of stock. I live-chatted with Chris at Penguin, who assured me that he worked with both versions, and that they were identical, save the color. My experience with the Penguin live-chatters is that they have always been straight shooters. (While they won't go out of their way to criticize a Penguin product, if you ask a specific question, you will get a candid answer.) I'm so glad I went with my gut to purchase this. Based on last night's performance reaction, this will be part of my live show for a long time. This is great you can do so much with it. Please write now click add to cart!! !